Think it’s impossible to wear black in Summer? Think again. Style maven Mariona Planas of Diario de Estilo or Diary of Style looks effortlessly chic in a monochrome outfit, perfectly complemented by our very own Angel Jackson ‘Cowboy over sized leather folding clutch’ in black. After embarking on a blog that would encapsulate her unique and sophisticated style, Mariona was snapped up by Elle Spain magazine and is now one of their resident bloggers. We love how effortlessly she has styled her Angel Jackson bag; a simple black cotton cropped top paired with high-waisted shorts by Cheap Monday, the mirrored Ray Bans add just the right amount of attitude to compliment the butter soft leather clutch. 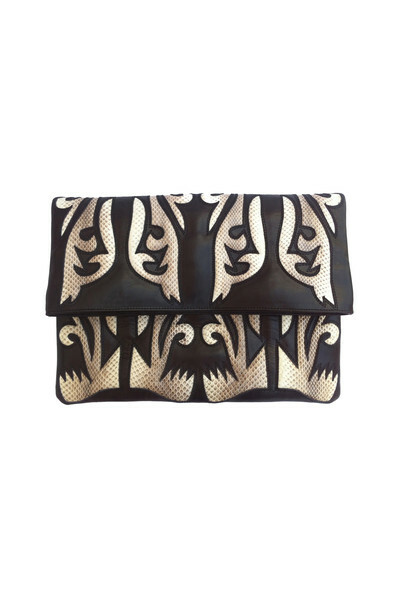 This hand cut and stitched Angel Jackson folding leather clutch has been reworked in super soft milled leather with intricate cut work to reveal genuine snakeskin beneath. A chunky gold zip adds an element of biker chic to this great day into night over- sized clutch. Front compartment features canvas patch pockets, perfect for credit cards. Outer: leather and water snake outer and cotton. Interior: canvas with leather trim. Has been featured by numerous international fashion publications and a firm favourites with stylists and bloggers this season. ← MINI BAGS..MINI SKIRTS..FASHION GOES MINI MAD! !